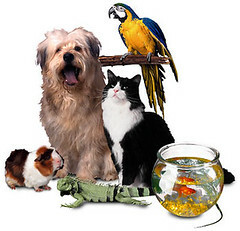 Today is the start of National Pet Week (May 6-12). The main goal of this week is to promote responsible ownership and care. This is also another time when we can celebrate our pet and shower them with our affection and gifts (they may be more interested in the gifts though). Here’s to all of the pets all around the world and to us being caring owners and providing them with the love and attention they deserve each and every day. This entry was posted on Sunday, May 6th, 2007 at 3:55 am	and is filed under Other Pets, Cats, Dogs, National Dog, Cat & Pet Info, Events for Pets & Owners. You can follow any responses to this entry through the RSS 2.0 feed. Both comments and pings are currently closed. Happy Pet Week to all our furry friends and to those that do not have homes too, whether feral or in shelters. I’d like to thank my pets for all the love and care they’ve given me and to the ferals and other critters I care for outside. And thanks to all of our little heroes that have suffered or perished in the food crisis. They will never be forgotten, but should have a special rememberance this week of all weeks. And remember, we did not kill them, its all those involved in the food making process. I’d like to make a special thanks, especially this week for all this board has done for all of us during this food crisis and for all the other little bits of non-food info it provides. Happy Pet Week! Now more than ever, they all need a special week of hugging!